In 2017, growth-focused professionals used MarketingPlanner.io to build, enhance, and optimize their marketing plans. Learn more in this annual report. It allows businesses, creative professionals, and other individuals to build highly personalized marketing plans that align with current trends and best-practices. In theory, these two goals perpetually reinforce one another: as individual users interact with the tool, the aggregate data improves; as the aggregate data improves, individual plans become more effective. In this way, it’s our hope MarketingPlanner.io creates a steady in- and outbound flow of actionable marketing intelligence. Each month, we publish an update on the MarketingPlanner.io blog. This update contains aggregate data about the ways in which users engaged with the tool during the previous month. By summarizing and aggregating user activity from the previous year, it’s our hope annual updates like this one will help identify trends and develop even more comprehensive sets of actionable intelligence. Personal and corporate brands, bloggers and social media influencers, agencies and marketing professionals, businesses in traditional and cutting-edge industries, education entities and other non-profits — MarketingPlanner.io served a diverse range of users in 2017. Going forward, we hope both the tool and these reports will continue helping growth-focused professionals reach their goals faster, make more informed decisions, and market more effectively. In 2017, MarketingPlanner.io hosted 2,171 unique visitors from 1,181 total cities around the world. 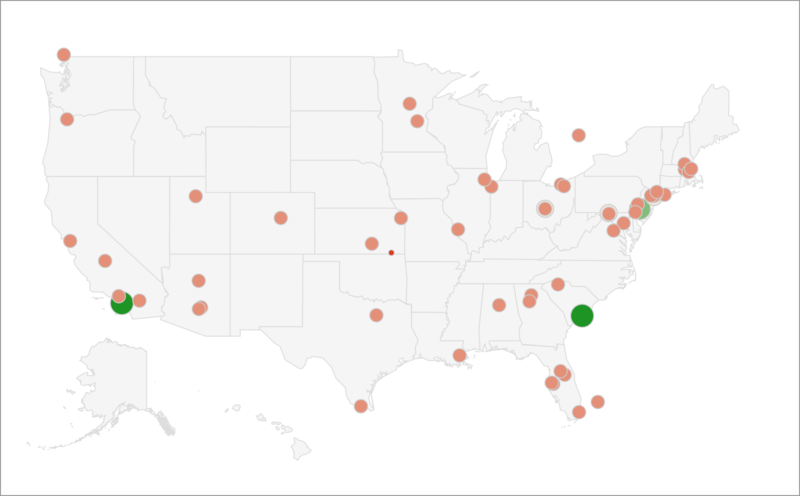 This is an average of 181 visitors and 98 cities per month. In the first quarter of 2017, we ran search engine and social media ads to support the tool. Approximately 1,011 (46.56%) of visitors arrived as a result of these paid campaigns. The others visits were organic. 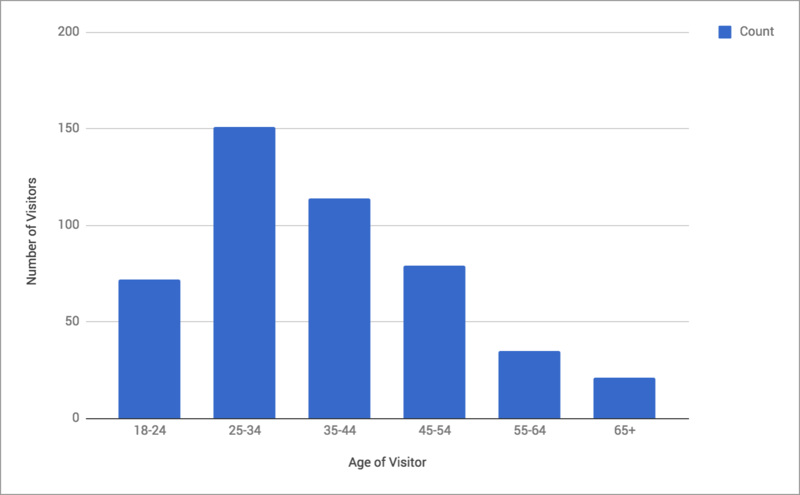 The majority of our visits — 1,588 (73.15%) — originated in the United States. Major urban areas in the southwest and northeast accounted for, perhaps, 25-30% of visits. The others were spread fairly evenly across the rest of the United States. Every market save the following six accounted for < 2% of total visitor traffic. 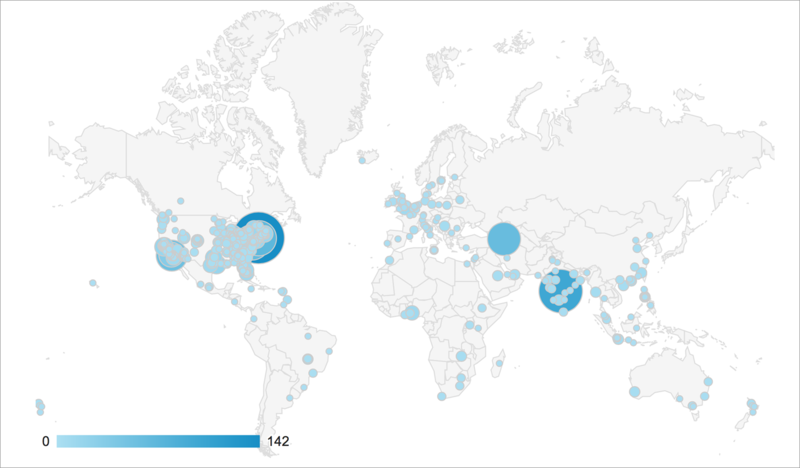 121 visitors from around the world created marketing plans. 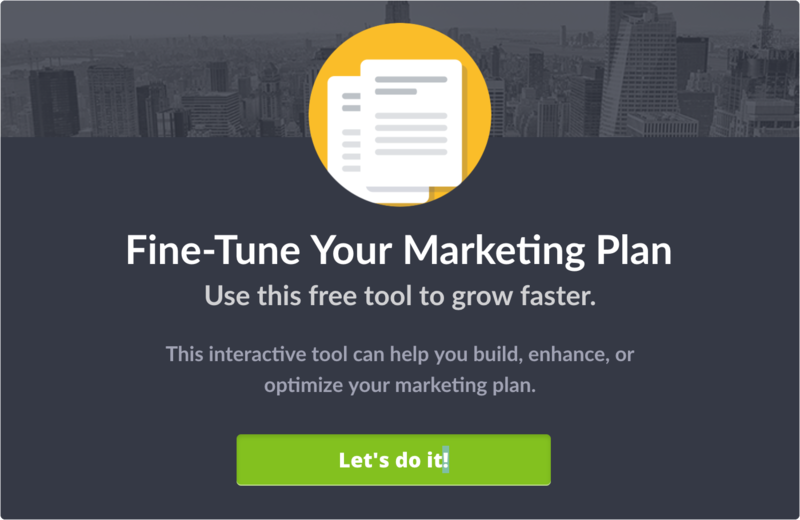 This gives MarketingPlanner.io a conversion rate of 5.6%. 78% of these users are located in the United States. User location trends largely mirror those of visitors. However, while visitors were largely urban and concentrated in major coastal markets, our user base is more geographically diverse. About half our American users live in rural areas in the interior of the country and regional capitals like Columbus, Ohio and Wichita, Kansas. With a few exceptions, this is true internationally as well. 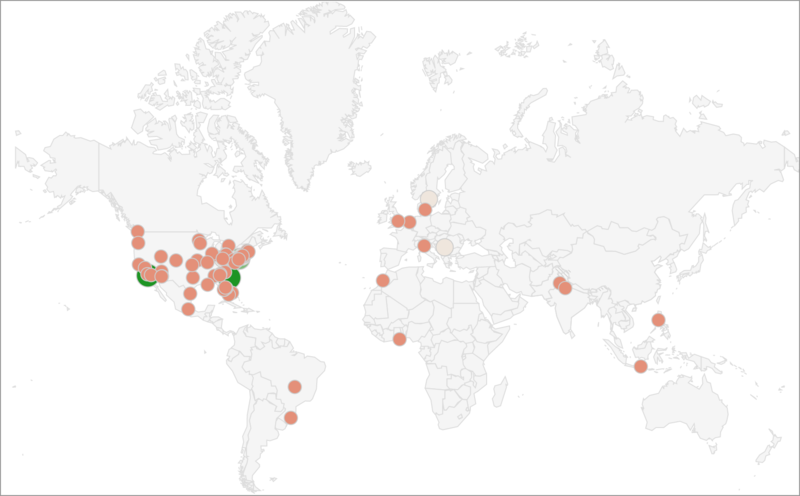 For example, instead of London, Stockholm, and Milan, we have users in Northhampton, Falköping, and Bologna. MarketingPlanner.io users had average revenue, budgets, or funding resources of $702,313.08, and they planned to spend an average of $64,132.92 (9.13%) on marketing. However, when responding to the question, “What percentage of your annual revenue, budget, or funding would you like to dedicate to marketing?,” users suggested they planned to budget an average of 8.25%. 8.25-9.13% is substantially higher than the 2-5% that the US Small Business Administration recommends for organizations that generate < $1mil/year. While we don't know how old our users' organizations are, these rates are more in line with Entrepreneur‘s recommendation that businesses 5 years or older spend 6-12% on marketing. 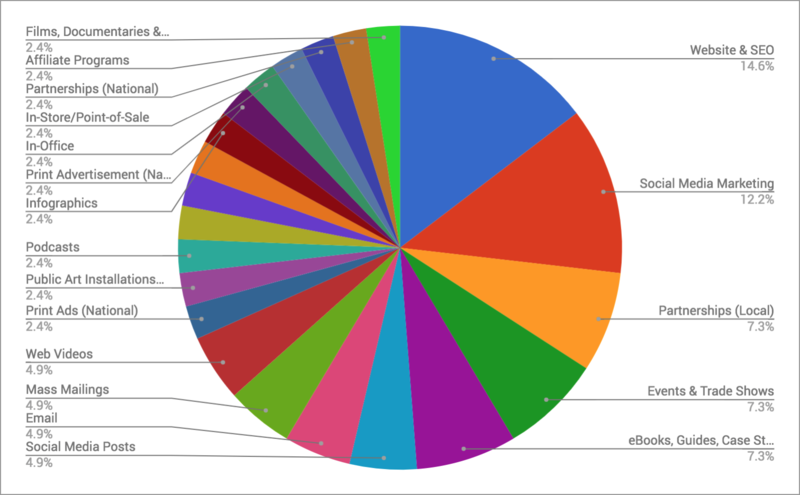 User marketing plans were dominated by digital, content, and field-marketing techniques, specifically, on websites, social media, downloadable eBooks and reports, and events and trade shows. Unsurprisingly, given the fact that our users tend to live in rural areas and small/midsize cities, local partnerships also performed well. The majority of MarketingPlanner.io visitors and users are young and mid-career professionals aged 25-44 who work at small businesses and startups. (Our largest user budget is $25millon. Only thirteen of 121 are > $1million.) These professionals demonstrate an affinity for technology and business as well as for travel, media (especially film and music), investing, and lifestyle experiences. Interestingly, MarketingPlanner.io visitors and users are slightly more likely to be female (52.37%) than male (47.63%). While our current data set is small, this may suggest women have a good bit of control over the marketing budgets of small and early-stage enterprises. To improve the reliability of our effectiveness scores, we need to boost the number of survey responses, especially among experienced professionals at larger enterprises. We need to incentivize visitors and users to share the tool more widely and evangelize on its behalf. This should boost the MarketingPlanner.io conversion rate and thereby increase the quantity of data flowing into the system. We need to find reliable ways to encourage repeat visits to, and uses of, the tool. At the moment, most users build plans with which they never re-engage. We want MarketingPlanner.io to be an integral part of users’ routine marketing workflows, and we want all plans to serve as up-to-date reflections of users’ current marketing activities. Whether you need to build, enhance, or optimize your organization’s marketing plan, MarketingPlanner.io can help. It’s free and easy to use.